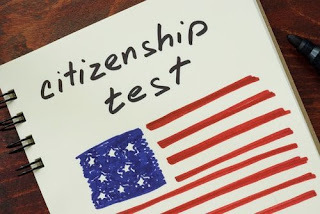 Test Instructor: "It's good to see all of you eager would-be American citizens prepared to take your written test. You're all one step closer to your goal of being a contributing American. I hope you all got the memo I sent out explaining the old test is no longer applicable under the Trump regime. Those of you who did get a study guide for the new test may have a few questions before we begin. "Yes sir, I wonder why we no longer have to memorize the Pledge of Allegiance?" "I see you're confused. What's your name?" "Juan Cardoza, I'm from El Salvador." It's similar, "I pledge allegiance to Donald Trump, and to the regime he's installed in The Once United States of America, and to the corporations who stand for Fascism, and the wealthy." "I have a question senor!" "Estuardo Alarcon, I'm from Guatemala. I don't see anything in the guide referring to the US Constitution. It took me a year to memorize all the laws and amendments. Why is this? "Are you a trouble maker Estuardo?" "Things change. Nothing strange about that. I hope you memorized the newly revised Law of the Land under Lord Trump." "See senor. I haven't slept since you passed it out to applicants yesterday." "All right people! No more questions as I pass out the test. No talking. If we even think you're cheating, you'll be escorted back to the border by an attack dog and one overworked border patrol officer. Good luck!"